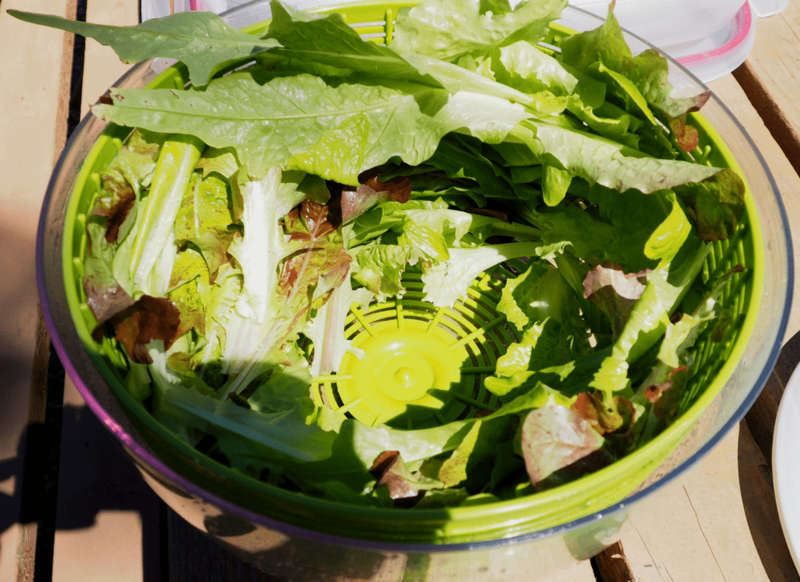 So you’ve picked your lettuce and there is more than you can eat for dinner. 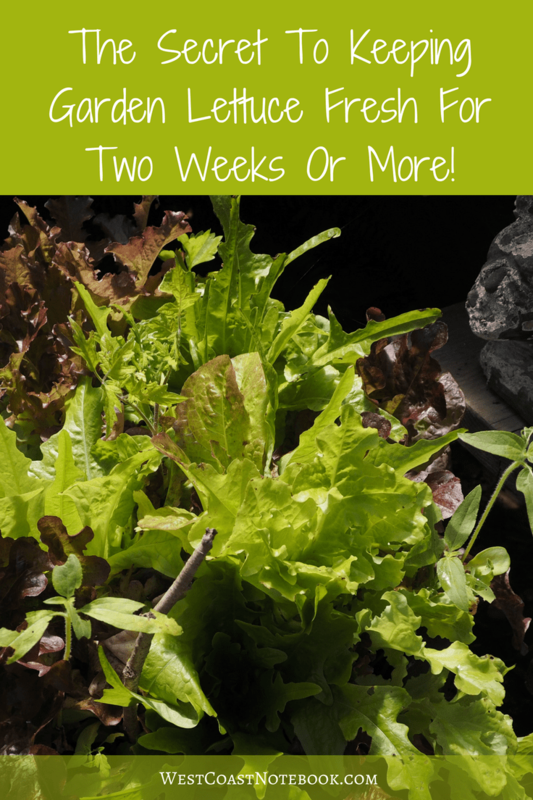 Here’s the secret to keeping garden lettuce fresh for two weeks or more so you can enjoy it longer. 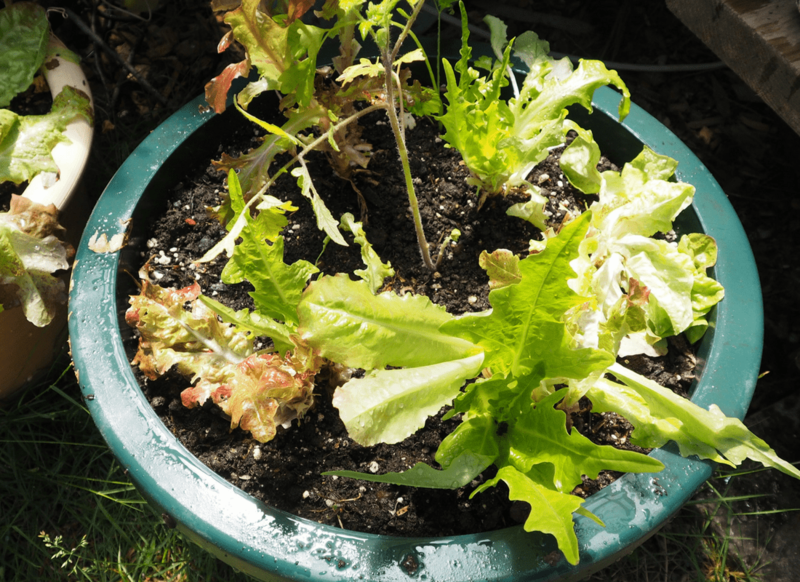 This year we are having a hot summer, so besides having lettuce in the garden (full sun) I also planted it in containers by the house where they are in the shade most of the day. As I had been picking from the garden before the lettuce bolted, I had left the ones in the containers alone and they were getting a little bushy. If you are picking from the garden, I would encourage you to pick early in the morning or late in the day when it’s not so hot and the leaves will be less inclined to wilt. Tools consist of a bucket to throw the dead leaves into and a pan with cold water in it to put the lettuce trimmings. I start by pulling off all the dead leaves, working my way around the plant from the outside to the inside. My preference is Looseleaf lettuce rather than head lettuce. You can get multiple picking off of it rather than just cutting one big head. I take off most of the outer leaves and just leave the leaves in the centre as you can see from the picture below after I thinned. I know… it looks a little sad, but it won’t be long until it looks like the top picture again. 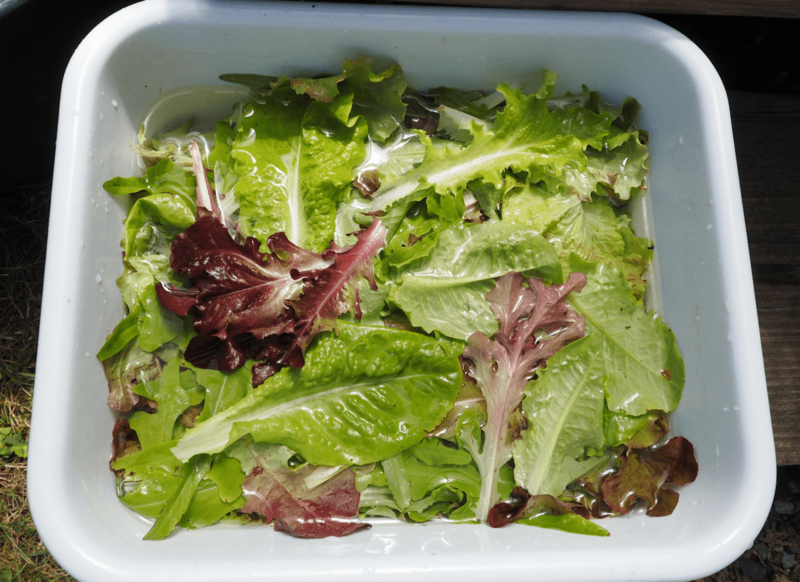 Placing the thinned lettuce leaves in cold water is key to this process. 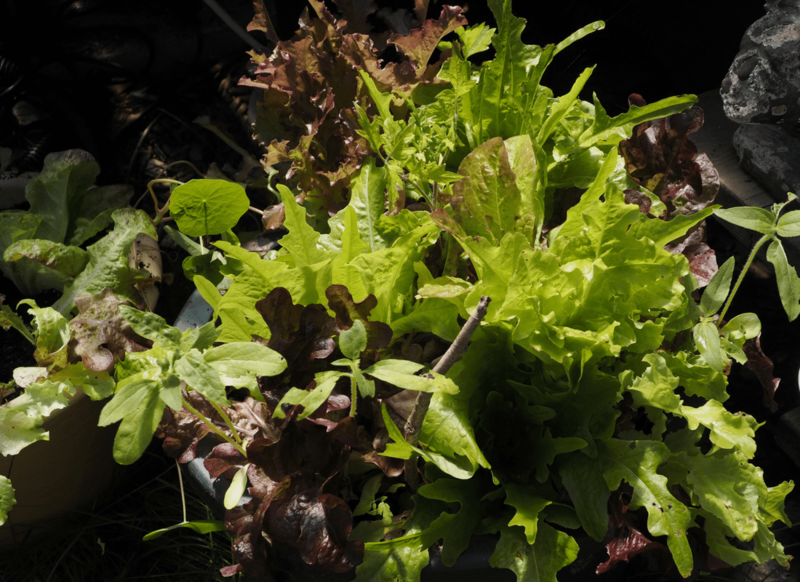 It stops the lettuce from wilting, preserves the moisture and washes off any dirt or bugs. You can also take it into the house and wash it in the sink, but I find that if I’m going to be spending some time trimming that it’s better to put them into cold water right away. 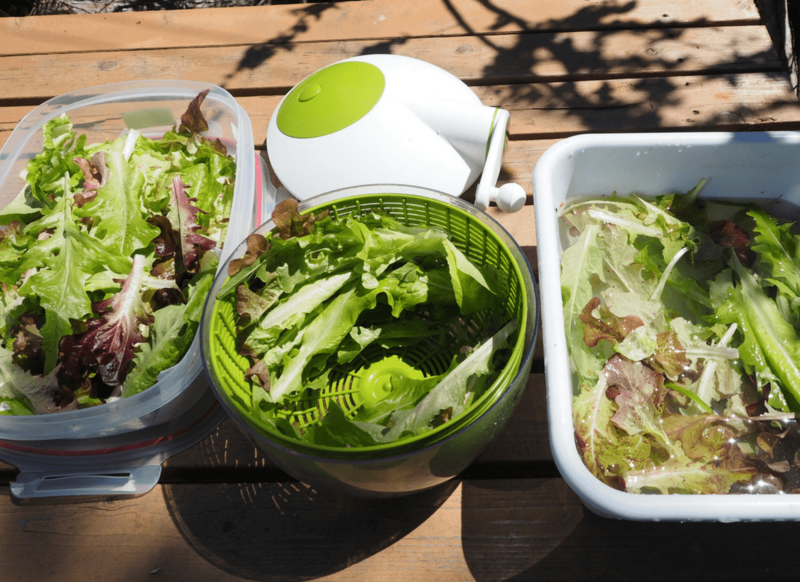 As you take the lettuce out of the cold water ready to put into the salad spinner, swish the leaves around in the water to make sure you get all the dirt off of them. 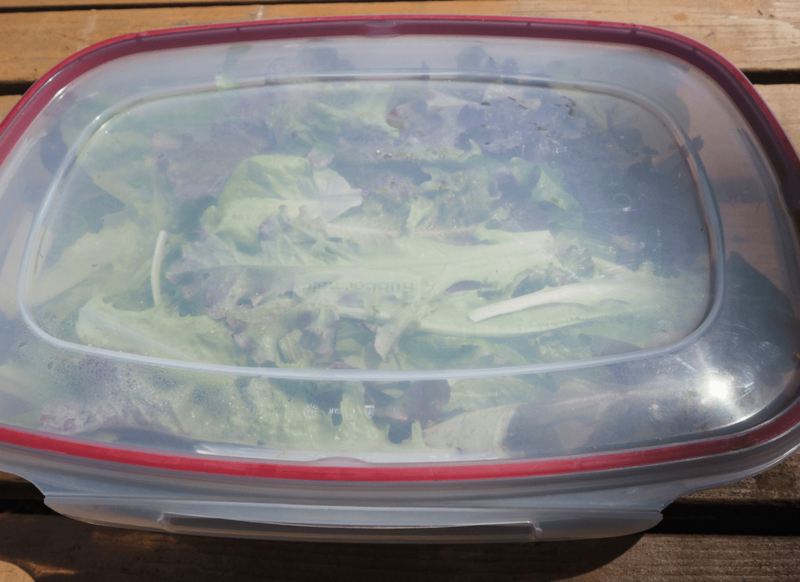 Meanwhile, prepare a container to receive the lettuce. I use a plastic resealable container because it is easy to put into the fridge and I can stack items on top of it, but a plastic bag works just as well. Whatever container you decide to use, put a paper towel in the bottom of the container. This is KEY. You might want to put in two sheets depending on the size of your harvest. I don’t bother wetting it as the moisture from the leaves will moisten it and keep them from going soggy. 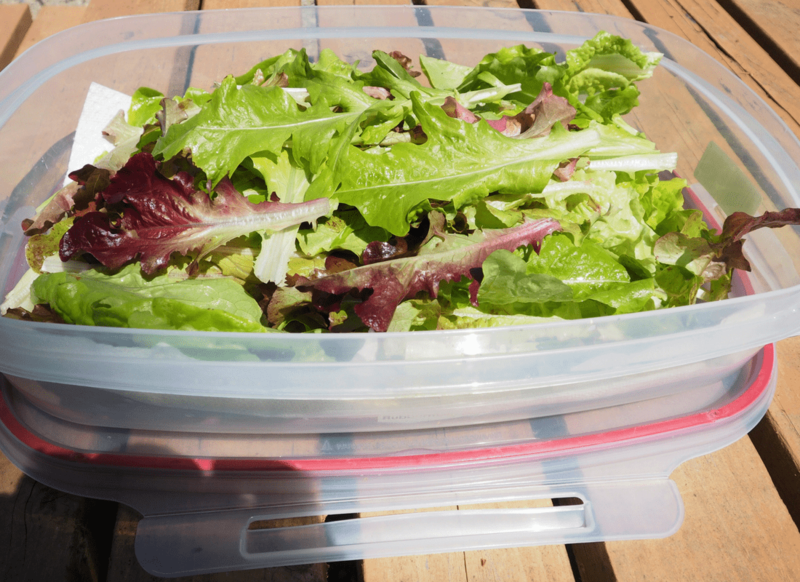 Once the spinning has come to a stop, take the lettuce out and place it in your container. You can see the paper towel underneath the lettuce in the picture below. Here is a picture of the complete process of washing, spinning and putting into the container. As you can see I’m left-handed otherwise the pictures would have been in reverse order. Now seal up the container or twist tie it if you are using a plastic bag and put it into the fridge. If you do the lettuce this way it will last for more than 2 weeks. The only thing extra that I do when I go to use it is to maybe take off the end of the stalk because sometimes it turns a little brown. Once you’ve done the hard work, it’s so easy just to pop into the fridge to get out a couple of leaves for a sandwich or to make a salad. You can do the same thing with your swiss chard and kale if you have an excess of them and want to use them up.